Kimeramon soundly defeats the DigiDestined. Wormmon leads Davis and Veemon to the power source of the base. It turns out to be a golden Digi-egg, which Davis uses to golden armor digivolve Veemon to Magnamon. The story to action quotient is much lower here than in the previous episode, but considering the finales to such anime as "Attack on Titan" this can hardly be considered a problem. The opening scene of Kimeramon destroying a small town is suitably grim and essentially what Metalgreymon should have done while under the control of the Emperor. The battle sequences in the base are decent, but the two bouts with the Bakemon are just reflections of each other, which is quite unwelcome given the quality of the rest of the animation. 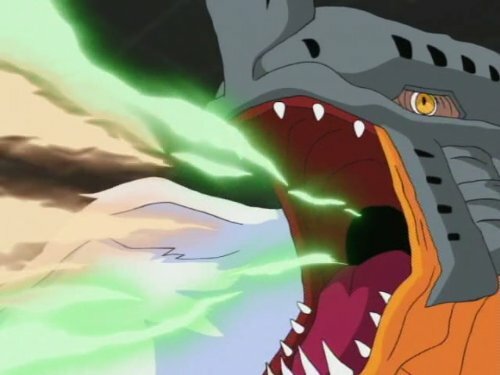 The fight with Kimeramon is a great showcase for his strength and makes way for one of the best moments of the episode: Ken showing compassion for the in-training digimon. It is redemptive qualities like this that elevate the antagonists of this series far above their predecessors. Ken continues to be haunted by the voice of Devimon, which excellently conveys the sense of gradually losing control that will culminate in the next episode, and Davis is given the opportunity to take control of the situation, important because this story arc has not really been kind to Davis since the eighth episode. Also, Magnamon is pretty cool.